Obviously this is going to be a short list (haha, SORRY MUM). My mother and I do not always see eye to eye on all things parenting. For example, she once exclaimed to me in a horrified tone, “You’re not planning on breastfeeding him past six months, are you?” as though I had just told her that I fully planned to still be exclusively breastfeeding Piglet when he went off to university, and that even then I might have to visit him at weekends to dispense “Milky Pops” as and when required. She also seems to be utterly convinced that my siblings and I slept through the night on cue, never needed feeding at night and were toilet trained by the time we turned one, all of which may be the result of a bit of artistic licence over the past thirty-odd years. However there are, inevitably, times when I have to bow to her greater experience, and one of these was the other day. The thing is, Piglet seems to have a bit of an obsession with the washing up. I can only assume that he has inherited this from the sperm donor’s side of the family, as there is no chore that I detest more vehemently than washing up. When I lived in Japan, I actually had flies living in my sink, such was my neglect of this particular household burden, and the thought of ever not having a dishwasher again fills me with dread. Needless to say, in my current living arrangement with my mother, we have an unspoken agreement that I do all the cooking, and she does all the washing up. However, as you can imagine both of these activities are somewhat more challenging with Piglet in attendance, and while cooking often seems to have the effect of making him want to crawl as quickly as possible towards the hot oven in order to inspect its contents, or into all the cupboards to see if there is anything-preferably made of glass or containing things that will make an unholy mess-that he can remove and start throwing about, attempting a bit of washing up makes him take up residence on the floor next to the sink, lifting his arms and screaming until he is picked up and allowed to dangle his little hands in the bubbly water. Hmm, is this where you keep the washing up liquid? 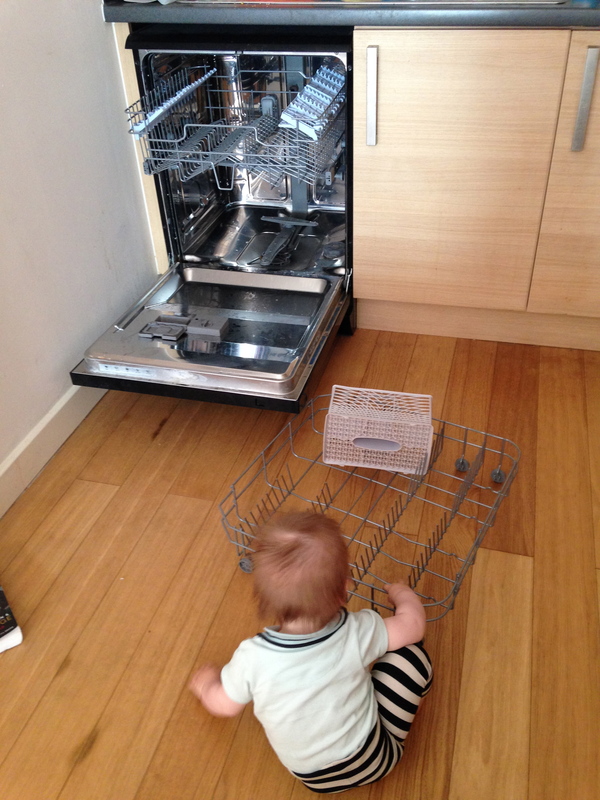 I might add here that having a dishwasher is no saviour. We have one in our flat, and Piglet was never more alert than when Mummy was loading and unloading, at which point he would come scurrying across the room like a herd of ants carrying a leaf, and jump inside it at the first opportunity. Anyway, keeping in mind the fact that Piglet is clearly a future homemaker and all-round Domestic God, the other day when he was having an episode of particular crankiness, I decided that I knew exactly what was going to calm him down and cheer him up. Was it a quick feed? A distraction toy? In The Night Garden? No, it was the rare treat that is MUMMY DOING THE WASHING UP. I cannot actually remember the last time I did the washing up. Lo! I thought, I shall be a kind, loving daughter who does the washing up while her mother is out at work. What a wonderful, thoughtful thing to do! Especially as it was me who got all the plates dirty anyway, and I haven’t done the washing up since 1992! My mother will be so pleased, and Piglet will be happy playing with his lovely bubbles. The effect was exactly as planned. Piglet was thrilled. 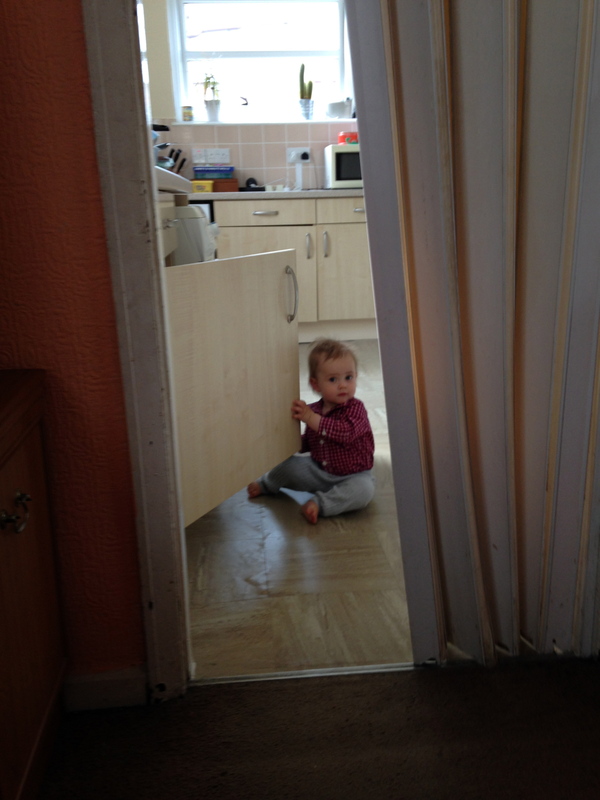 He took up residence on the kitchen floor, lifted his arms and commenced squealing. He literally would. Not. Stop. Squealing. I had to lift him up repeatedly and allow him to cover himself in bubbles, and every time I put him down he wanted to be picked up again. He literally wanted to be in the washing up bowl with the plates and cups. It was a NIGHTMARE. Realising that I was not going to get anything done, I decided he would need to have his own little mini washing up bowl, purely for his enjoyment and pleasure. You know, like babies have their own toy TV remotes, toy mobile phones and toy ride-on cars. That was what Piglet needed, a plastic toy version of the real thing, preferably in garish colours and singing a song at the touch of a button. What he needed was an old takeaway container filled with washing up water. Actual washing up water. The genuine article. I filled up the container and set it down in front of him on the floor. He picked it up, and immediately emptied the water everywhere. It was of course at that moment that my mother decided to arrive home from work, picked a sodden Piglet up off the floor and berated me for making a mess of her kitchen floor and generally being a terrible mother. She then harangued me for making Piglet all wet, while he crawled off back into the kitchen and promptly slipped over on the wet floor, landing on his face and howling. The look of pure self-satisfied glee on my mother’s face as she grabbed a screaming Piglet off me and proceeded to give me a dressing down was indescribable. She had won, and she knew it. Mummy was an idiot, and a failure of a mother. Mummy nil, Granny one. Haha – so cute! Yes, my kids also LOVE water and soap and making a mess. I think it’s in their hard wiring. I do let my kids make a mess with water and soap every so often on a warm day preferably outside! Piglet loves it! Thanks for commenting.